The title of this plan of Hanover Square and the Parish of St George appears with the publisher's imprint at lower right. Compass star and scale bars are featured at top left. 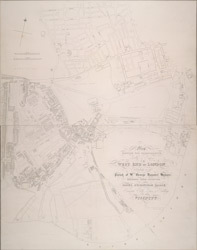 The plan shows Buckingham Palace and additions made in the Regency period to the street plan. The Parish of St George was established in 1725 and extended from Regent Street (then called Swallow Street) to the Serpentine, and from Oxford Street to include the whole of Mayfair, Belgravia and Pimlico.